L. L. "Stub" Stewart Memorial State Park is a 1,654-acre (669 ha) Oregon state park in Washington County near the community of Buxton. When the park opened in 2007 it was the first new full-service state park in Oregon since 1972. The park includes hiking trails, horseback riding, RV and tent campsites, and cabins among other amenities. Located off Oregon Route 47 in the foothills of the Northern Oregon Coast Range, the park connects to the Banks–Vernonia State Trail. Plans for a park in Washington County began in the late 1990s. By 2001 a master plan had been completed and the acquisition of land for the park began. Construction began in 2003 when roads were installed to the park area from Highway 47. By 2005 construction of the facilities and campgrounds had begun on the $18 million facility. The park was scheduled to open for the Memorial Day weekend in May 2007, but the opening was delayed until July 8, 2007. The working name for the park was Washington County State Park, but was later changed to Hare's Canyon State Park. In 2005, it was changed to the current name which honors the memory of lumberman and state representative Loren LaSells "Stub" Stewart, who had died in January of that year. He had served an extended time on the Oregon Parks and Recreation Commission, the co-owner of lumber company and a noted philanthropist. The park opened mountain bike-only trails in June 2012, the first in the state. Washington County Circuit Court Judge Hollie Pihl pushed for the State of Oregon to build the new state park on the plot of land it is currently on to connect it with the Banks-Vernonia State Trail he and his wife helped build. Because of his contributions, Pihl had a scenic viewpoint named in his honor called "Hollie's Point of View", a double entendra for those who knew him, as he was a very opinionated man. 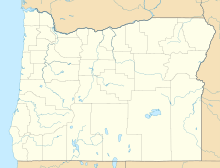 Located four miles (6 km) north of U.S. Route 26 and 11 miles (18 km) south of Vernonia on the east side of Oregon Route 47, Stub Stewart sits primarily on former timber land along the Banks–Vernonia State Trail. Natural features include a hill that rises from an elevation of 730 feet (220 m) to the 1,250-foot (380 m) level. Other natural features of Stub Stewart Park are canyons and forests. The built environment includes several vehicular bridges, a visitor center, cabins, day use areas, and horse camp. Other items include 78 camping sites that include 43 full utility hook-up sites, 23 hike in primitive campsites, 12 walk in tent sites, and 15 cabins. These cabins share a central shower and restroom building. There are two Disc Golf courses onsite. "Lil’Stub", a beginner friendly pitch and putt 9 hole course, and a full 18 hole course that has multiple pin positions. The horse camp contains 16 campsites. Fourteen horse campsites have single-RV parking and a four-stall corral. Two horse campsites have a six-stall corral and double-RV parking. There are roughly 15 miles (24 km) of trails at the park. It is the only full-service state park in the state’s second most populous county. Plans are to add a group tent and day-use areas, a group lodge, a star gazing tower, single-track mountain bike trail and more cabins in a second phase when funds become available from the state lottery. ^ "L L Stub Stewart State Park". Geographic Names Information System. United States Geological Survey. Retrieved 2011-07-01. ^ a b Gorman, Kathleen (May 29, 2007). "Opening of state park is set back to late June". The Oregonian. ^ a b c d e f Colby, Richard (June 23, 2005). "Building excitement". The Oregonian. ^ a b "Stub Stewart State Park: Stewart timeline". Oregon Parks and Recreation Department. Archived from the original on 2007-09-05. Retrieved 2011-07-01. ^ "Make reservations at the newest state park". The Hillsboro Argus. July 20, 2007. ^ a b Gorman, Kathleen (August 10, 2006). "Park laying groundwork for outdoors enthusiasts". The Oregonian. ^ Richard, Terry (June 1, 2012). "Stub Stewart State Park opens mountain bike trails". The Oregonian. Retrieved June 2, 2012. ^ a b c d e "L.L. Stub Stewart State Park" (broshure). Oregon Parks and Recreation Department. Retrieved 2011-07-01. Wikimedia Commons has media related to Stub Stewart State Park. "L.L. Stub Stewart State Park". Oregon Parks and Recreation Department. Retrieved 2011-07-01. This page was last edited on 23 October 2018, at 02:43 (UTC).